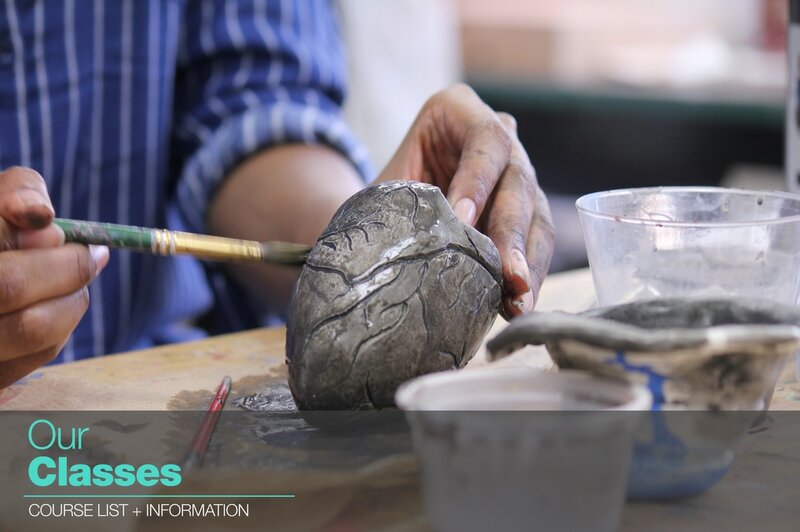 The Visual Arts program encourages innovation while stressing strong technical and presentation skills. The program also promotes an awareness of current issues and ideas in the visual arts as they relate to contemporary society. The comprehensive curriculum allows students to build upon a foundation of Design Concepts and Drawing I in their freshman year and continues with studio, art history, and portfolio development classes with their experience culminating with an intensive Senior Project. Design concepts is taught in two separate classes, a 2D Design Concepts class taught by Ms. Lyons, and a 3D Design Concepts class taught by Ms. Whittier. Each class is a semester long. The course is aimed to teach Freshmen students the basics of design that they will implement throughout their time at ARGS. Drawing I is taught by Mr. Bartlett and teaches Freshmen Visual Arts majors the fundamentals of drawing. The class focuses on introducing students to new techniques, critiquing their peer's work and fostering their creativity, self-expression and self-confidence. Drawing II, taught by Mr. Bartlett, Drawing II goes more in depth with the concepts and techniques taught in Drawing I and gives students more freedom to explore and develop their personal style. Sculpture I/II, taught by Ms. Whittier, takes the basics learned by students in 3D Design Concepts and expands on them. Students work on assignments that help them explore new mediums and techniques. They will then hold group critiques with their peers to gain new perspectives on their work. Painting I, taught by Mr. Bartlett, introduces students to the fundamentals of painting for the first time. Students will work on assignments aimed at teaching them the building blocks of the medium, with lessons focusing on color, composition, and light. Graphic Design I, taught by Mr. Bartlett and Ms. Lyons, introduces students to the technology and techniques needed for design. Students will be introduced to and taught to utilise Illustrator, Photoshop and InDesign programs. Students will also explore elements of typography, color, and learn about modern graphic designers. Ceramics I, taught by Ms. Whittier, introduces students to clay medium and techniques. Students focus on learning the foundations of clay molding and create abstract clay pieces as well as plates, cups and bowls. Photography I, taught by Ms. Lyons, focuses on traditional photography and printing techniques. Students will be introduced to the functions of their camera and the fundamentals of light and composition. Digital Photography, taught by Ms. Lyons, focuses on photo manipulation and editing. Students will be taught to navigate Photoshop and other editing programs. Students will also be introduced to the functions of their camera and the fundamentals of light and composition. Taught by Mr. Bartlett, Drawing II and III goes more in depth with the concepts and techniques taught in Drawing I and gives students more freedom to explore and develop their personal style. Painting I, taught by Mr. Bartlett, and II, taught by Ms. Whittier. Painting II gives students more freedom in exploring the medium, and students hold critiques of their peers works. Painting II students are also free to design and work on a group mural somewhere in the school. Sculpture I/II/III, taught by Ms. Whittier gives students opportunity to explore three dimensional materials. Sculpture III students are given more freedom to work on independent pieces for their portfolios. Ceramics I/II, taught by Ms. Whittier, teaches students clay molding techniques and fundamentals. Ceramics II gives students more freedom to explore the medium and work outside their comfort zone. Photography I/II, taught by Ms. Lyons, focuses on traditional photography and printing techniques. Photography II goes more in depth with these studies and allows students more freedom to explore their photography. Graphic Design I/II/III and Digital Photography are taught by Mr. Bartlett and Ms. Lyons. Digital courses focus on teaching students Adobe programs such as Photoshop and Illustrator to implement in design and photography. Art History, taught by Mr. Bartlett, teaches students about art movements, artists and the development of certain mediums. Students will learn in depth about the artists that may have been mentioned in their studio classes, and will gain a greater knowledge and appreciation for art as a whole. Taught by Mr. Bartlett, Drawing IV gives students freedom to develop work for their portfolio and work outside their comfort zones. Painting I, taught by Mr. Bartlett, and II/III, taught by Ms. Whittier. Painting II/III gives students more freedom in exploring the medium, working on portfolio pieces, and students hold critiques of their peers works. Painting II/III students are also free to design and work on a group mural somewhere in the school. Photography I/II/III, taught by Ms. Lyons, focuses on traditional photography and printing techniques. Photography II/III goes more in depth with these studies and allows students more freedom to explore their photography. Sculpture I/II/III/IV and Ceramics I/II, taught by Ms. Whittier, gives students opportunity to explore three dimensional materials such as clay, paper, and wire. Sculpture III/IV students are given more freedom to work on independent pieces for their portfolios. Senior Project, taught by Ms. Lyons, is a class for senior visual art majors to develop their portfolio, artist website and other portfolio works. A visual arts major's ARGS career culminates into their Senior Project, with which this class will be devoted to.